Surprisingly not whiny, and even more surprisingly, really cool. Could easily become their best ever.<br><br>Edit: It has. It's awesome. Much better than the When I'm Gone-Your Love Is A Pie era, but still a very poor effort.<br><br>Edit: It's getting better, the 'heart-heart, heart-heart' part still irritates me though. Ich mag Natasha Bedingfield sehr und "Simple Plan" sind auch recht gut. Also bisher lieferten beide Acts schon häufiger gute Tracks ab.<br><br>Zusammen müssten dann die Funken sprühen. Die vermisse ich in diesem Song etwas. 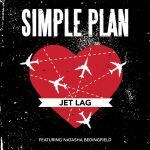 "Jet Lag" ist ein gefälliger, netter Pop-/Rocktitel, mehr nicht. 4*. This was a pleasent surprise from the normally whiney Simple Plan. <br>A solid pop/rock tune and up their as one of their best.<br><br>Spent a single week atop of my personal chart.<br><br>Came in at #8 on my TOP 200 OF 2011.